INTRODUCTION: Recently, laparoscopic colon cancer surgery has been accepted as a treatment strategy for colon cancer. 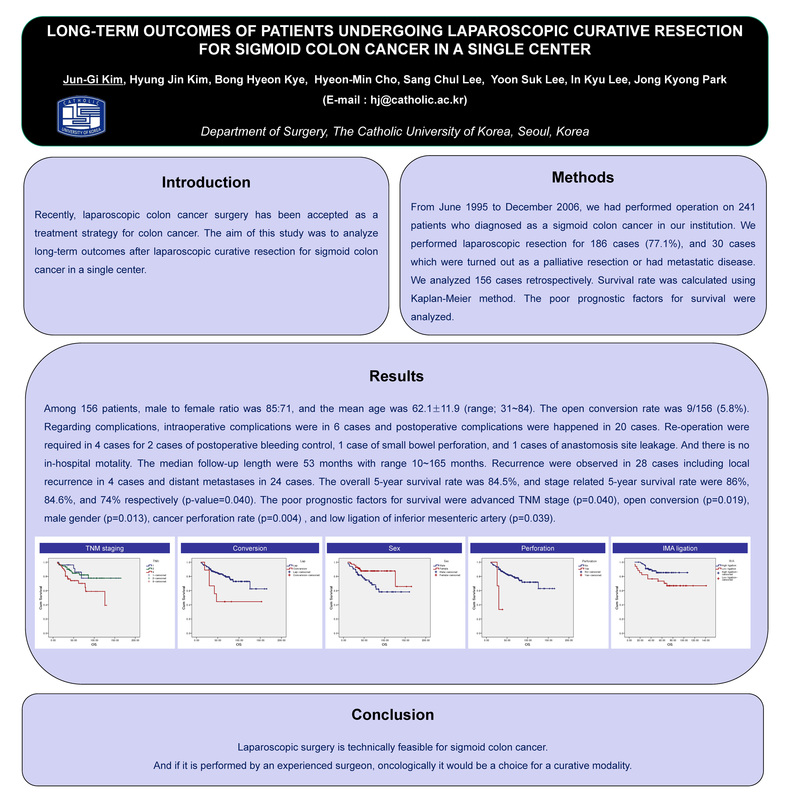 The aim of this study was to analyze long-term outcomes after laparoscopic curative resection for sigmoid colon cancer in a single center. METHODS AND PROCEDURES: From June 1995 to December 2006, we had performed operation on 241 patients who diagnosed as a sigmoid colon cancer in our institution. We performed laparoscopic resection for 186 cases (77.1%), and 30 cases which were turned out as a palliative resection or had metastatic disease. We analyzed 156 cases retrospectively. Survival rate was calculated using Kaplan-Meier method. The poor prognostic factors for survival were analyzed. RESULTS: Among 156 patients, male to female ratio was 85:71, and the mean age was 62.1±11.9 (range; 31~84). The open conversion rate was 9/156 (5.8%). Regarding complications, intraoperative complications were in 6 cases and postoperative complications were happened in 20 cases. Re-operation were required in 4 cases for 2 cases of postoperative bleeding control, 1 case of small bowel perforation, and 1 cases of anastomosis site leakage. And there is no in-hospital motality. The median follow-up length were 53 months with range 10~165 months. Recurrence were observed in 28 cases including local recurrence in 4 cases and distant metastases in 24 cases. The overall 5-year survival rate was 84.5%, and stage related 5-year survival rate were 86%, 84.6%, and 74% respectively (p-value=0.040). The poor prognostic factors for survival were advanced TNM stage (p=0.040), open conversion (p=0.019), male gender (p=0.013), cancer perforation rate (p=0.004) , and low ligation of inferior mesenteric artery (p=0.039). CONCLUSION: Laparoscopic surgery is technically feasible for sigmoid colon cancer. And if it is performed by an experienced surgeon, oncologically it would be a choice for a curative modality.